We left the California sunshine behind and as we approached our first overnight stay, we began to see the fog drifting in from the Pacific Ocean. This is definitely not the view that we’d been hoping to see but it was expected for spring which is when we were making this trip. 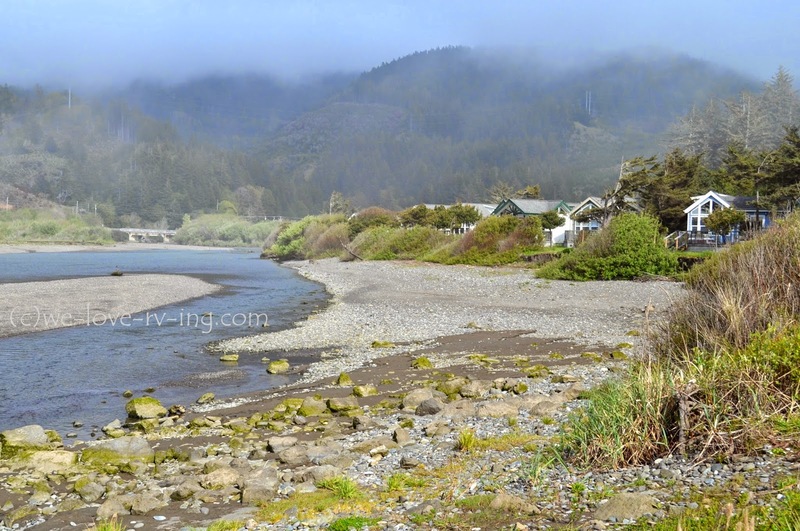 We stayed at the Turtle Creek RV Park on Hunter Creek and enjoyed a delicious fish dinner at a nearby pub that was across the road from our park. We saved our walk on the beach for the next morning. The next morning was socked in with fog so the view was pretty limited but it was interesting just the same. 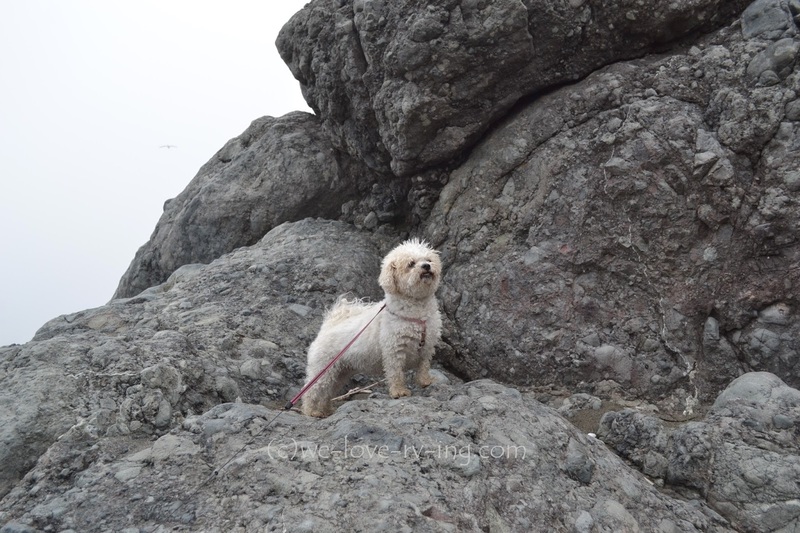 We took Maggie for a walk down to the beach, a short distance from the RV park and spent some time looking around. The fog has an eerie effect on everything and adds mystery to our surroundings. 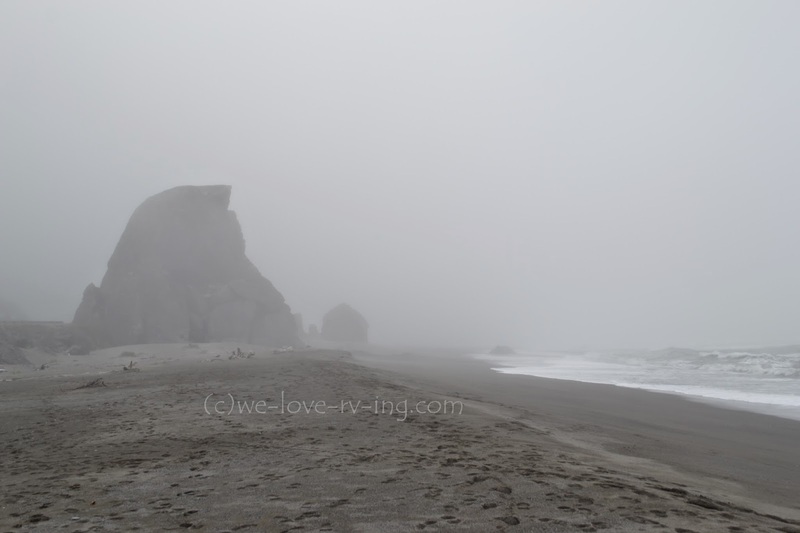 The huge rocks that are just offshore when the tide is in are barely visible from a short distance in this dense fog. Maggie gets pretty dirty in the wet sand, but loves investigating every nook and cranny she can find, which includes climbing up into the rocks. She has so many new smells and critters to find and takes that pretty serious, all ten pounds of her. 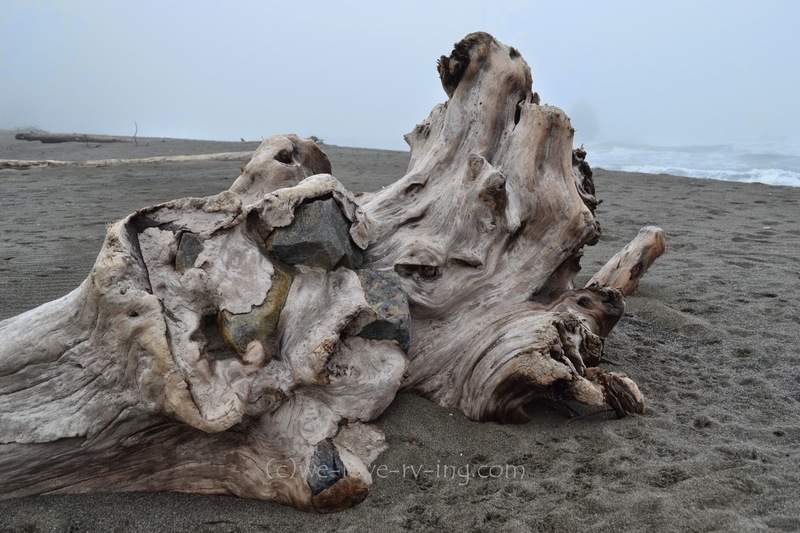 The driftwood can be quite interesting if you have a good look at it. The rocks embedded in this tree trunk are an interesting adornment. There appears to be some eyes peeking out from within the trunk, too, but the story about how it got to look like this will always be a mystery, befitting of the surroundings; it must be the fog! We finished our foggy morning walk and set off for sunnier places. The hopes of seeing the water didn’t look too promising as we drove up Highway 101. We parked on the side of the road for lunchtime, hoping that this viewpoint would clear up and offer sights of splashing waves and seagulls but other than great company and a little visibility, that didn’t happen. We still had sights to see in spite of the fog. We passed through several small communities that looked like they’d be a nice place to visit when the sun was shining. 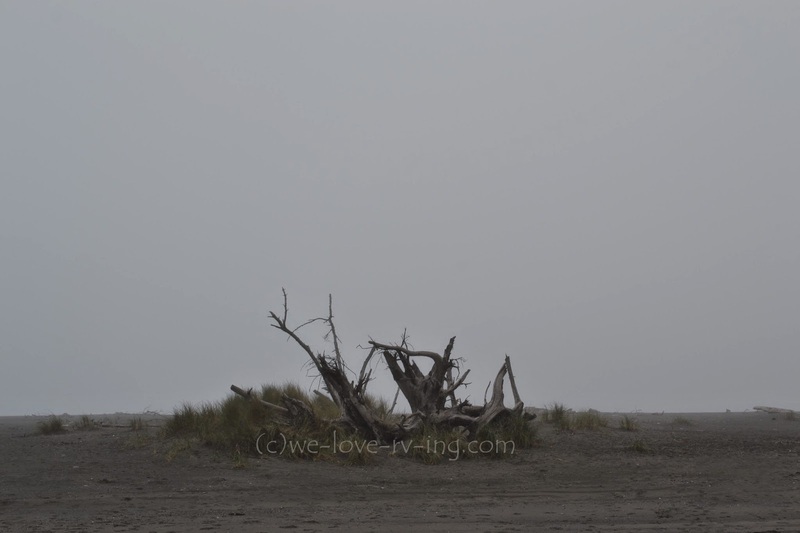 Our first full day in Oregon was a very foggy day but we had more days ahead and the sun would come out and change the whole view! Bring back the sun! Funny how the sunshine makes everything seem even better. 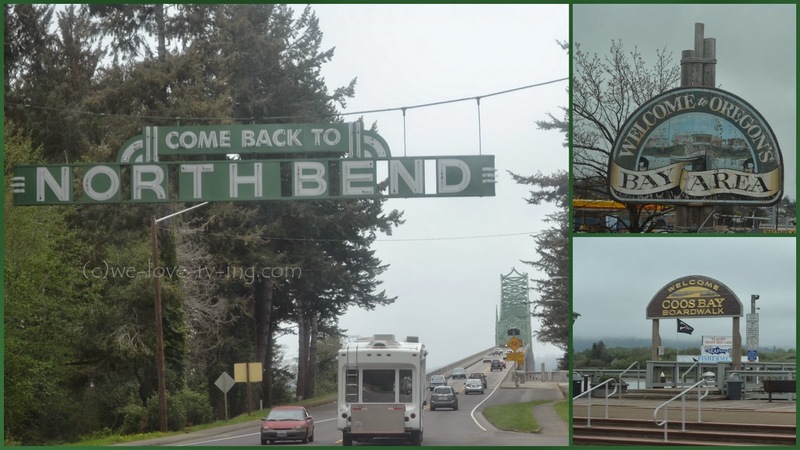 Check out this link to visit more of the Oregon coast and its' great sights. 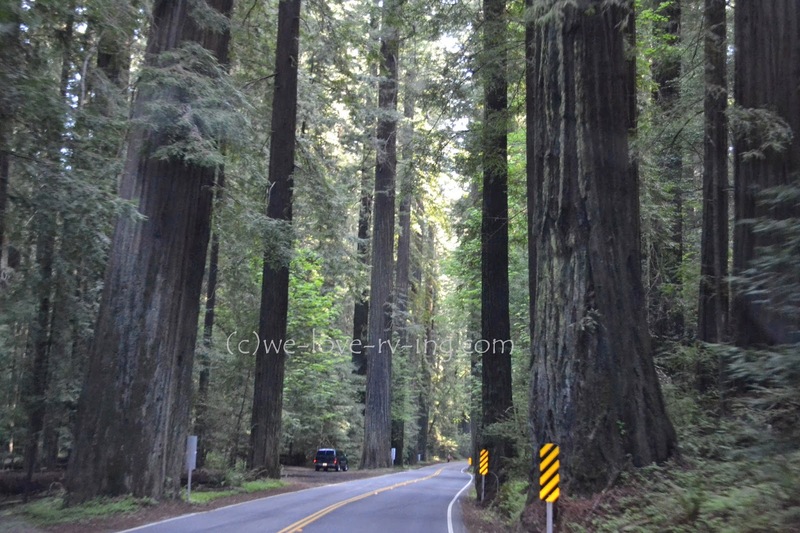 Today we are travelling over roads that we had travelled over before but so many years ago that all I remember is being impressed by the size of the big California redwood trees. It was definitely years before I would have the camera in my hand at all times to help keep the memories alive! 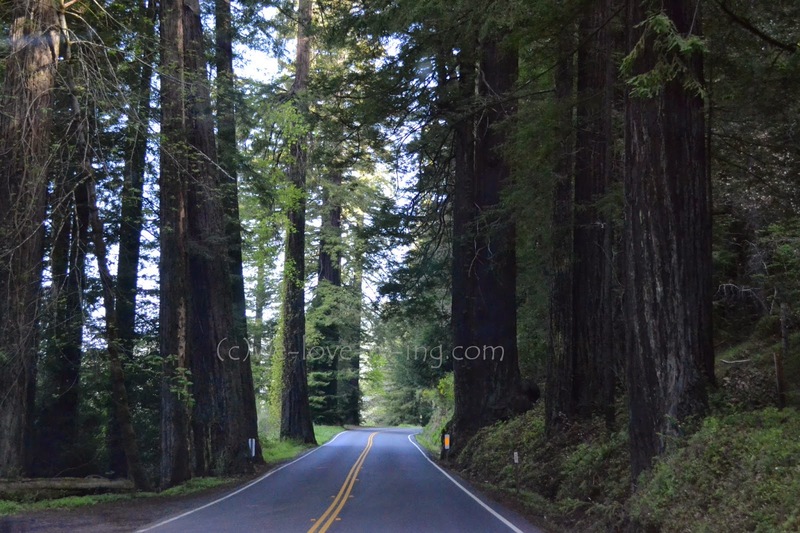 Without plans of what we were going to see other than a lot of California redwood trees, we got on the road to see what lies ahead. It wasn’t long and we came upon the sign “Avenue of the Giants”, running parallel with Hwy 101 and it sounded like the right route to take. 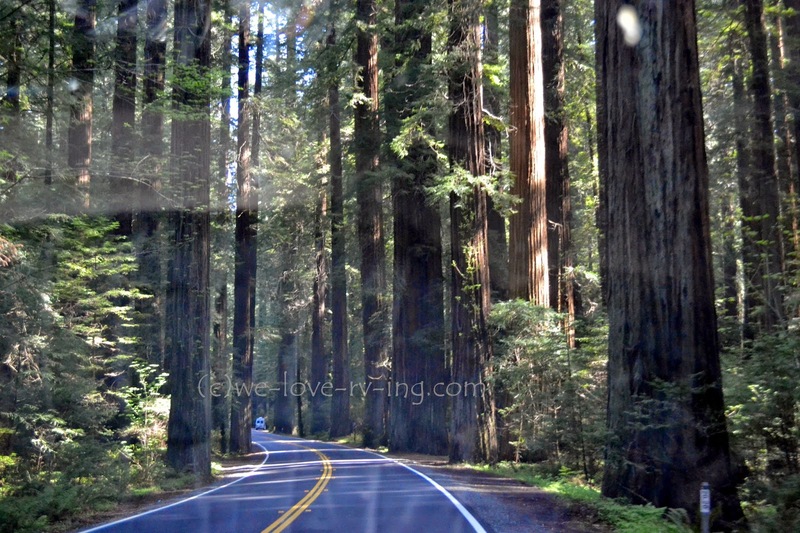 The Avenue of the Giants is a 50km (31mi) stretch of road that meanders through the Humboldt Redwoods State Park. 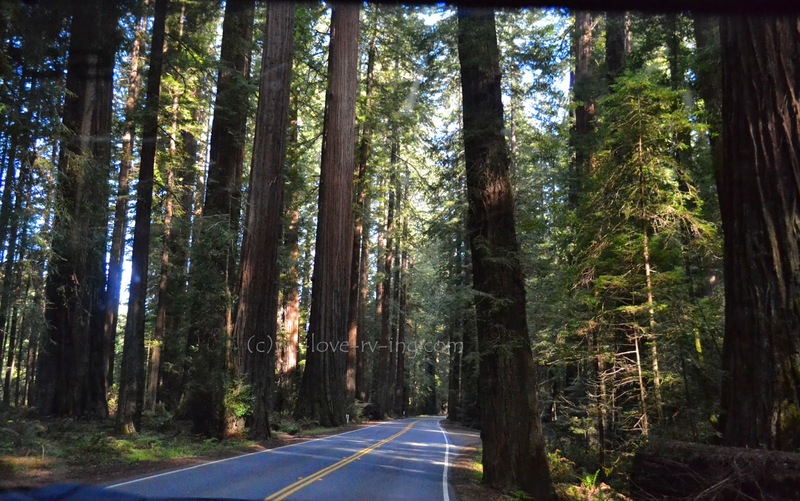 The quiet road, shaded by the towering redwoods, takes us on a beautiful scenic drive that can take as long as you’d like, if you’re enjoying all the trails within the park, as well. Summer season would not be this quiet as there are zillions of tourists come to enjoy this at that time. This road was originally built for wagons and stagecoaches in 1880. Following that, so many trees were logged off to fill the demand of housing during the Gold Rush days of California that there was concern for a total loss of the redwoods. 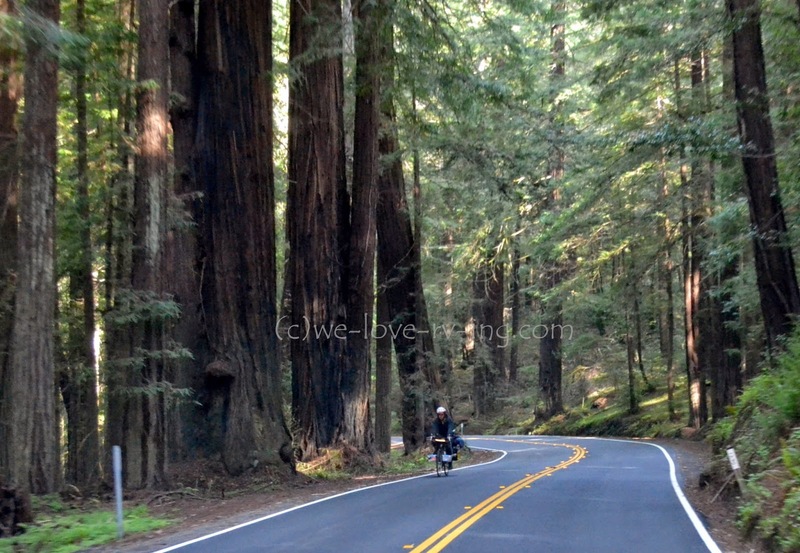 In 1920 the trail became the Redwood Highway and a movement had begun to save the California redwood trees. 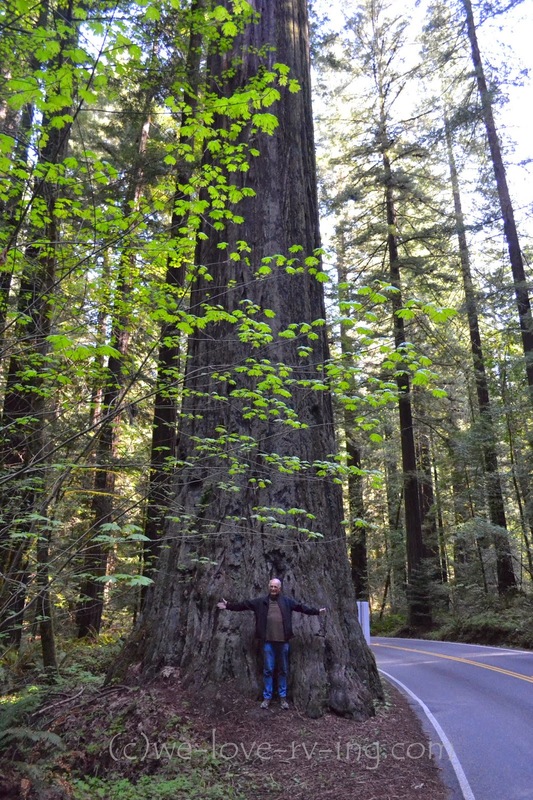 There was a time when this redwood tree grew around the world but they are now only native to the 450 mile stretch from central California to southern Oregon, thanks to those who participated in that movement which began during the early days of the twentieth century to save them. There are several locations called Auto Tour Stops that have interpretive panels with points of interest noted and trails to be able to see more by walking into the grove. Many are named after special people who have worked to save the California redwoods from becoming something of the past. The room to park at some of the Auto Tour Stops was not always enough for both of our big RV units so we made only one stop where there was room. It isn’t easy to realize the actual size of some of these trees but they can grow as high as 320’ and 24’ across and live as long as 2000 years. There is a total of 51,222 acres of redwood groves so needless to say we did not see them all but what we saw was great and with all the photos I took, I sure won’t forget this visit. We were on the road again and enjoying the sights of California. 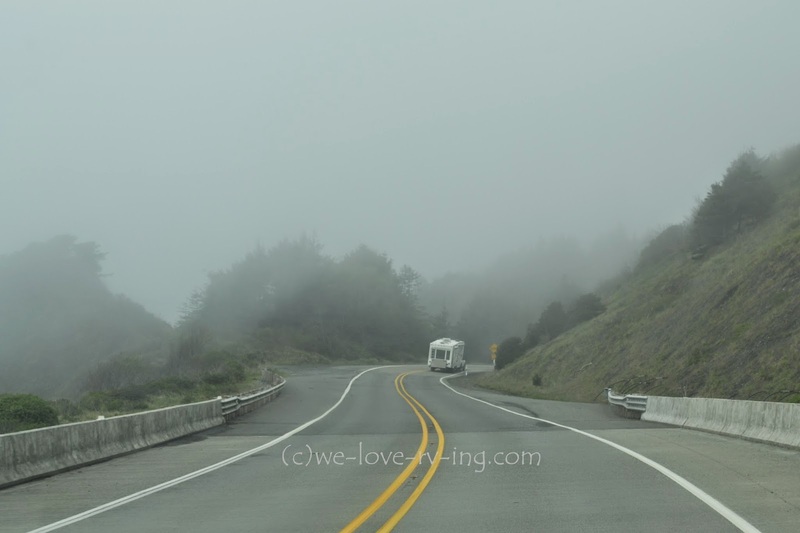 We were following the Pacific Coast Highway for most of our travels on this journey and heading north to and beyond San Francisco this morning. Today we were the followers and although we had all talked about which route we were taking, we were following our friends wherever they may go! 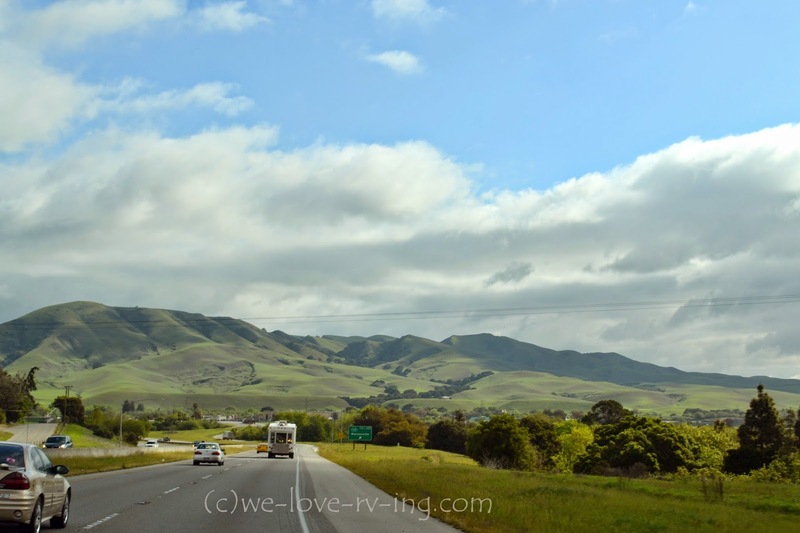 The green hills on Hwy 1 reminded me of some of our scenery back home before the summer heat turns the hills brown. Anytime we’ve been in this area has been in the spring so these hills may well become brown as the summer progresses, too, but they’re a luscious green today. 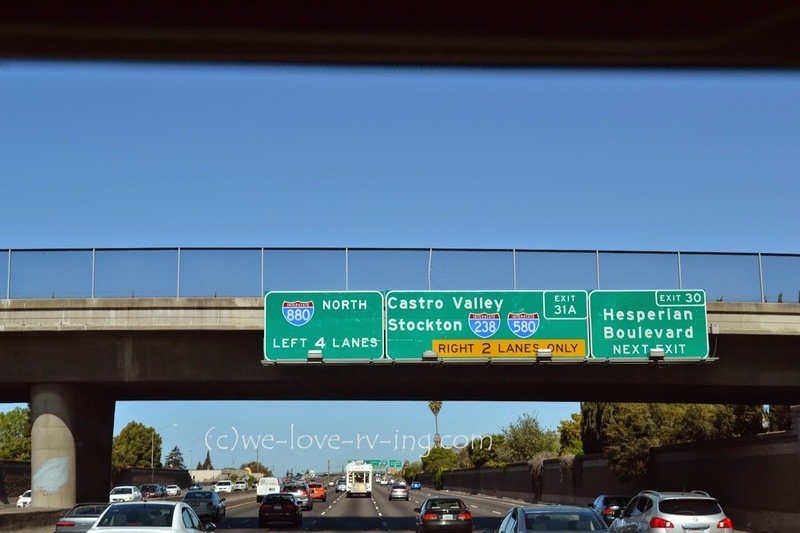 We had considered continuing to follow Hwy 1 but chose to follow another route, hoping to avoid any toll booths in this maze of freeways and bridges. The GPS offers the option of no tolls so we were following those directions and our friends. Thank goodness for two-way radios. Hwy 880 was the GPS chosen freeway. We sure were not avoiding any of the big city scenery on this route which included Oakland and Berkeley. Other than needing some navigating skills to keep us on the right freeway at times, there were no problems as we moved through the Saturday morning traffic. We’re enjoying the view which includes a very distant sighting of the Golden Gate Bridge across the San Francisco Bay. We continue until the next freeway change, which moves us onto Hwy 580. I would not recommend you follow my directions but if it feels confusing, you’ll understand our feelings on that lovely morning. 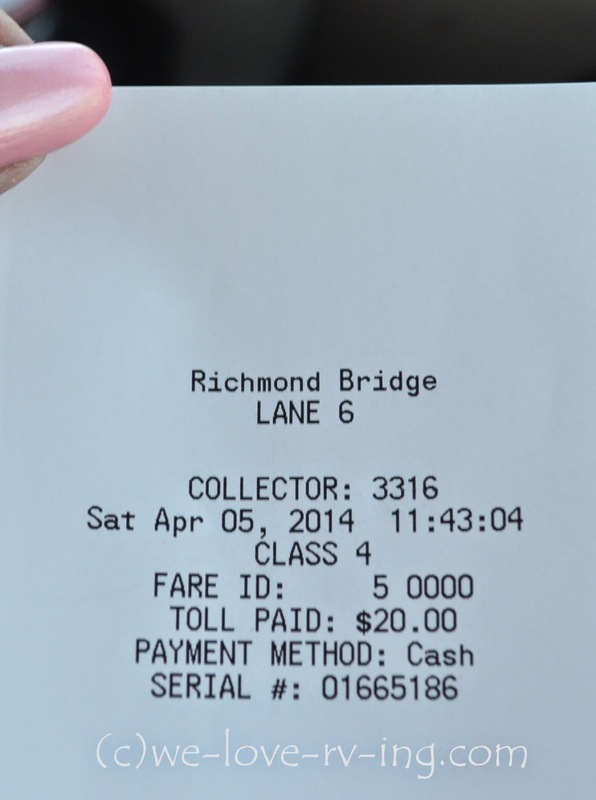 The next thing we know, we are approaching a toll booth! At this point we have no choice but to pay the toll and cross the bridge but as it turns out, there really is no choice in this part of the state. We would have been a long way inland and a very different route in order to avoid a toll and that was not part of our plan. As it turns out, the bridge we are crossing has some interest for us. 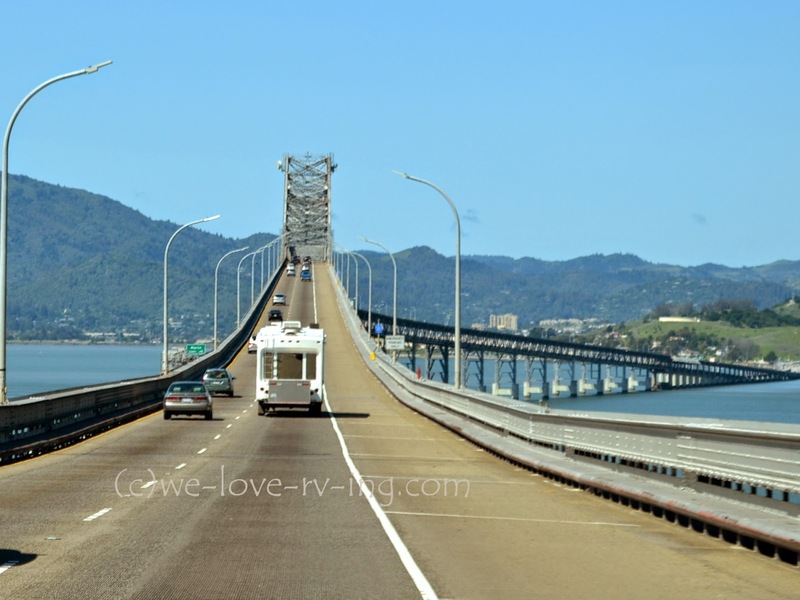 The Richmond San Rafael Bridge was built in 1956 and was the second longest over-water bridge in the world when built. It is 8.9 km (5.5 mi) long including the approaches. 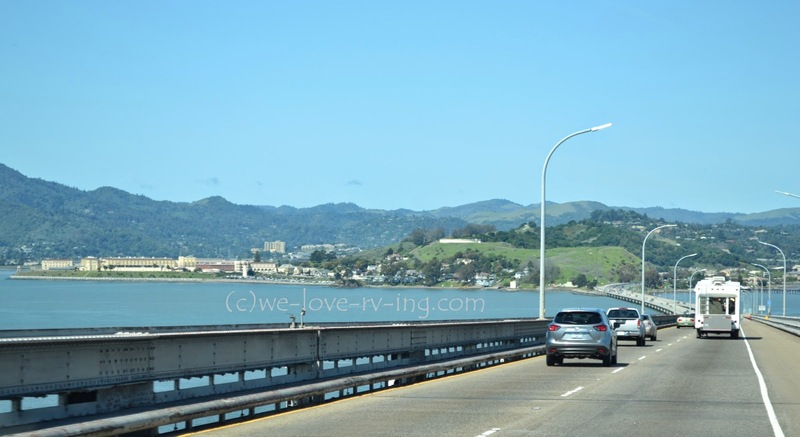 The longest was the San Francisco-Oakland Bay Bridge which we had crossed on a previous trip. 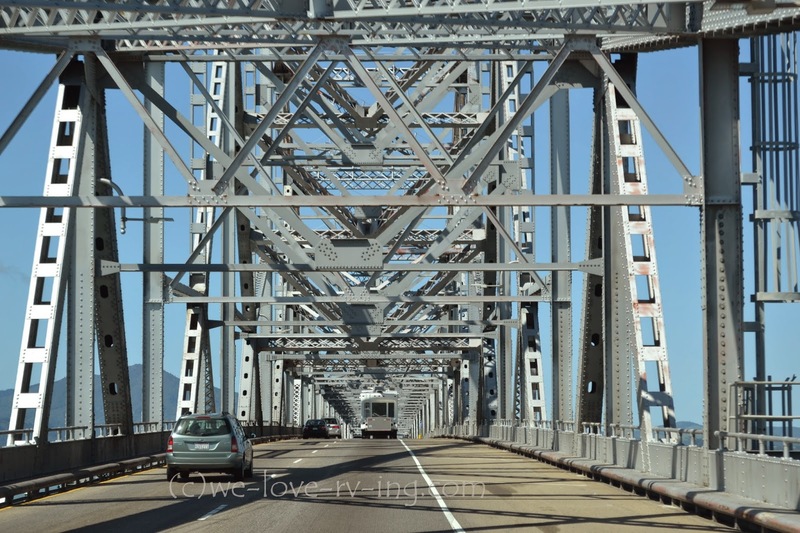 The third longest is the Chesapeake Bay bridge which we had crossed when touring Canada and the U.S. a few years ago. These photos do not show the full scale of the bridge but it spans over two ship channels and is often referred to as the “roller coaster span” so that will explain some of the ups and downs of the bridge surface. Once across the bridge we realize we are looking at San Quentin, which is the oldest state prison in California. It was built in 1852 and is still being used today. They do offer tours but that just isn’t on my bucket list and thankfully not on anyone else’s today, either. The rest of our day, back on Hwy 101, was sunny and green. 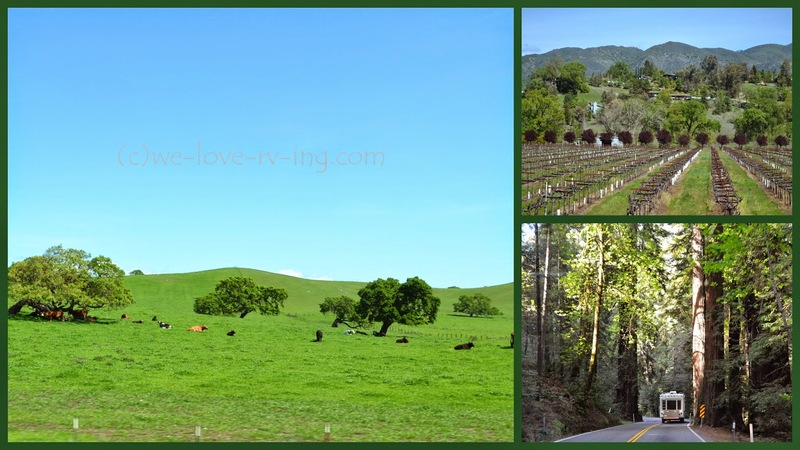 We passed green fields filled with resting cattle; we saw some wine fields before their spring growth; we stopped for groceries in the nice town of Willit then drove through some of those great California redwoods we’ve all heard about. 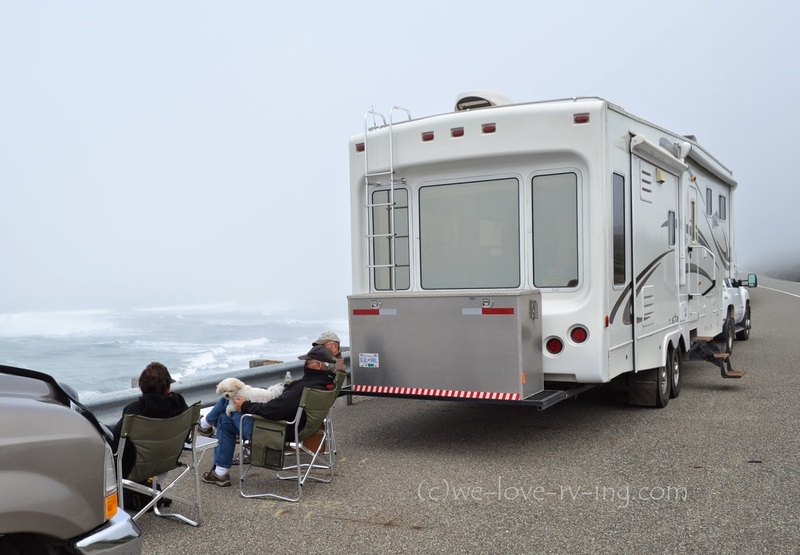 We spent the night at the Benbow RV park, talking about the great day we’d had and looking forward to seeing more of the Redwoods that we will see on our next day of adventures.